Stop Thief! 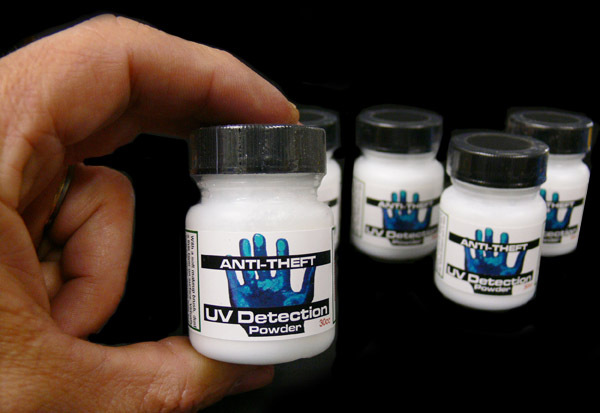 Our super-fine UV Detection Powder is great for all anti-theft purposes or countless UV (blacklight) experiments. Just a very light dusting (a soft makeup brush is ideal to use) and the powder is virtually invisible - but glows brilliantly under any UV light. Great for Military biological contamination training. 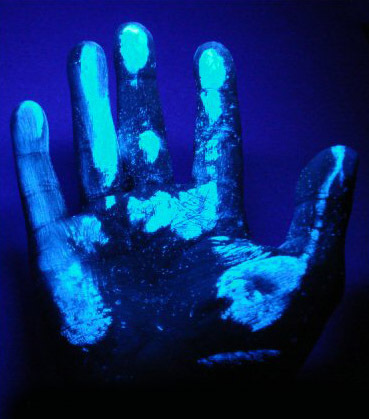 What it's also great for is showing little kids how far and wide germs spread just from one person touching another. Very versatile stuff. Perfect for catching someone suspected of stealing or touching something they're not supposed to. 30 cc. container. A little goes a very long way.